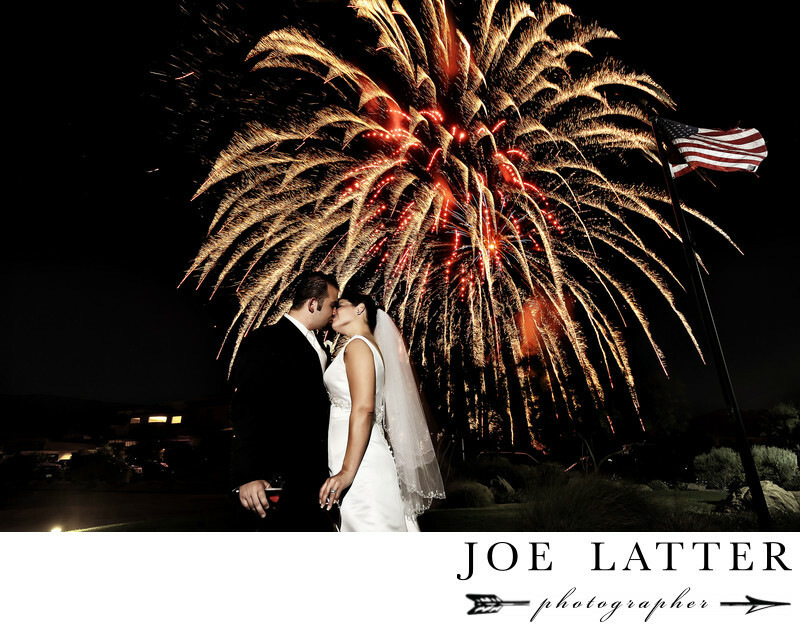 Amazing image of bride and groom kissing on Fourth 4thof July with fireworks at DragonRidge Golf Club in Henderson, Nevada. This amazing image was captured of my bride and groom kissing on Fourth 4thof July with fireworks exploding in the sky behind them at DragonRidge Golf Club in Henderson, Nevada...No Photoshop here! I took this image with a small flash on my camera and a long exposure with a tripod to get the fireworks located in the sky behind my bride and groom. I also positioned them so that we can have the American flag in the background as well. Added BONUS! It is like this rarely happen by accident which is why we arrived early to set up specifically for this one shot...Dragon Ridge golf club is located in Henderson Nevada which is only a short distance from Las Vegas.